Two “enhancements” for this release, but nothing too major. Consequently, this is Release Candidate 1. For those of you that are new to my site and my software projects, I treat my projects like “real” applications. When I get a new set of features that I want to work on, I start coding them. When an application gets to be somewhat stable, I make it available to the public – mostly for feedback and testing – for a couple of quick beta cycles. From there, once the application becomes stable and “feature complete” I kick it out the door as “released” and consider it to be done. Of course, some time after that, the cycle usually begins again with a new set of features. The point of this little blurb is to declare that SharpKeys is very close to being considered “done” as of this release. Better Add/Edit dialog – I’ve switched the one-lined DropDown list box for multi-lined list boxes. While this does make for a larger dialog, I find it to be worthwhile because more items are visible and it should be easier to find the key you’re looking for. I was contemplating multi-tab filtering system, but in all honesty, that sucked worse, so this is what I’m going forward with. Context menu – This is just for the List of mappings: right click on the list and you’ll see options for to match the buttons on the dialog. Just a little something to help navigation. Downloads are now over 2000, in three days! Previous PostSharpKeys 1.0 – Beta 2Next PostIE Scrolling Bug: Fixed! I am very frustrated at the way the keys on my new laptop are put in weird places, for example “” is where “Right Alt” should be. One wish: That the key “Fn” could be mapped to e.g. the Windows key. I seldom use it, and it is in the Windows key place. 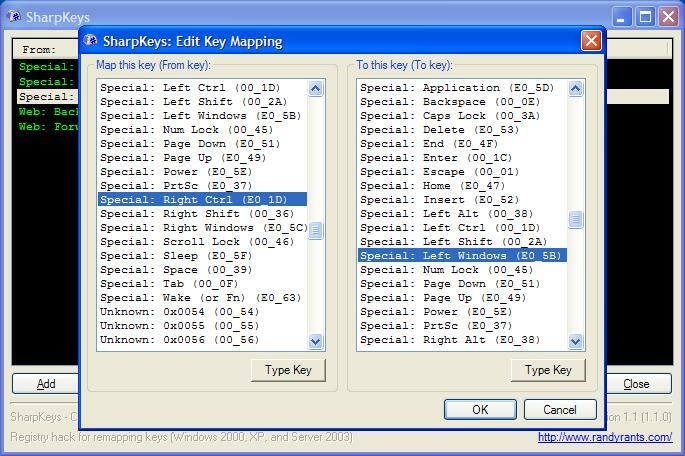 But I guess the “Fn” is a very special key for laptops and might not be possible to remap. Or…? :) See it as a new challenge. Thanks for your great application! Well the problem with Fn is that it might be different on every machine (not likely, but possible) and when I tried to get the scan code for it via C# it told me “00 00” which is obviously bunk. If I had the scan code, though, I would gladly add it to the list!